The Architect of the Capitol's Senate Office Buildings Masonry Branch, which includes 11 full-time employees, begins at 4 a.m. each morning to be able to complete most of its work before the rest of the Senate community arrives for the day. 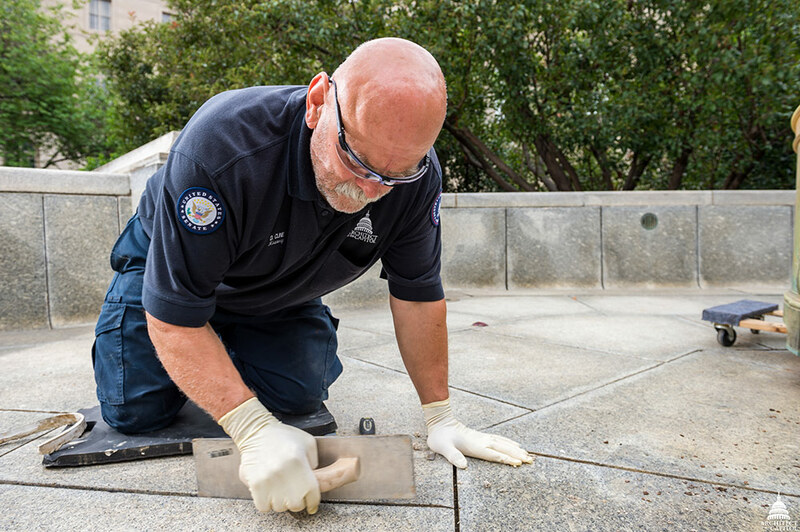 The masonry staff are true craftsmen — skilled at brick, tile, concrete, stone and decorative plaster — and they are passionate about stewardship and preservation of the Senate office buildings. Donald Kline removes failing caulking from the Russell Courtyard fountain. Their work is time consuming and exacting, but, because of their skill, is largely invisible once it's complete. Masons restore marble, color matching the epoxy to carefully hide the seams. They clean granite in the Senate fountains which gets stained because of sediment in the water. And they repair ornate decorative plaster elements which serve as focal points in key rooms in the Senate office buildings. Masonry staff also cut holes in the walls and the floor for needed infrastructure repairs and upgrades, then seamlessly repair them so that no one ever realizes that work has been done. 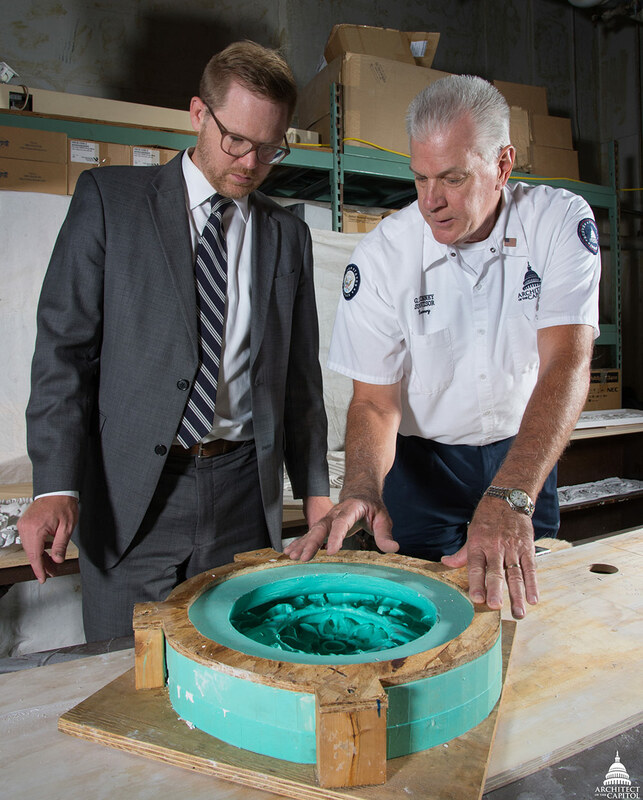 Assistant Superintendent for Tenant Services Paul Kirkpatrick learns more about the mold making process from Senate Masonry Branch Supervisor Glenn DeVinney, who has been with the Architect of the Capitol for 20 years. According to Masonry Branch Supervisor Glenn DeVinney, because the Russell Senate Office Building was built over 100 years ago, modern lighting, temperature-control systems and cabling must be seamlessly integrated into the historic building to provide state-of-the-art offices and hearing rooms for senators and staff. For one upgrade in the Russell Building, masons had to cut through a brick wall that was four feet thick. Abraham (A.J.) Jackson and Robert Gannon remove a mold from a plaster cast as part of historic preservation work in the Russell Building. The Masonry Branch is also focused on sustainability, with staff incorporating the latest advancements in masonry, including environmentally safe stone cleaning products. It is also committed to historic preservation. 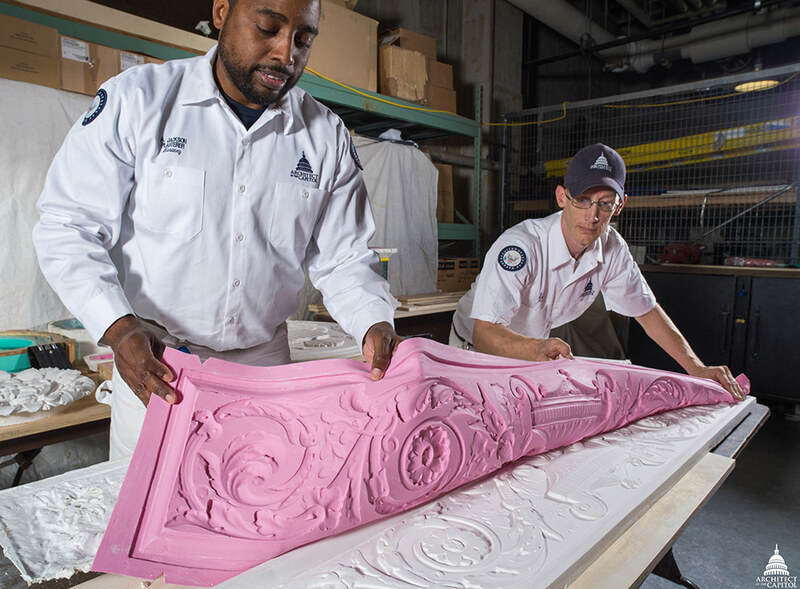 The staff is currently working to create and catalog molds of large decorative plaster elements in the Russell Building, which will be housed off-site in the event they are needed to recreate the historic plaster pieces. As Assistant Superintendent for Tenant Services Paul Kirkpatrick states, "Not only does the Masonry Branch do an outstanding job of preserving historic masonry, but they also provide invaluable assistance to many other trade shops. So often they serve behind the scenes, but their work brings out the true grandeur of the Senate buildings."